A suspected female cult member, identified only as Josephine, has stabbed Miss Lillian Friday, her classmate, in the right eye for refusing to join a cult group. The suspect and the victim are both SSS 1 pupils of Community Secondary School, Otuoke, in the Ogbia Local Government Area of Bayelsa State. It was learnt that the incident happened in the country home of former President Goodluck Jonathan on Thursday. The suspect (Josephine) was said to have been mounting pressure on Lillian to join a cult group which she persistently rejected. The victim’s uncle, Mr. Benson Agiobu, said his niece said Josephine and her gang insisted she must join their group or they would teach her a bitter lesson she wouldn’t forget. Agiobu said Lillian met Josephine on the way and she insisted that she must join their group. He said Josephine is a native of Ayakoro and Otuokpoti communities in the Ogbia council area, while his niece (the victim) is a native of Emeyal 1, in the same LGA. Punch gathered that the victim is currently receiving treatment at an undisclosed hospital in the state. A source, who spoke on condition of anonymity, said that the damage done to Lillian’s right eye was such that she might need to undergo a surgery. Speaking on the development, a human rights group on anti-cult activities in primary and secondary schools, Patriotism Advancement and Community Orientation Network, has condemned the incident. When contacted, the spokesperson for the police in the state, Bayelsa State Command, Mr. Asinim Butswat, said he had yet been properly briefed on the incident. 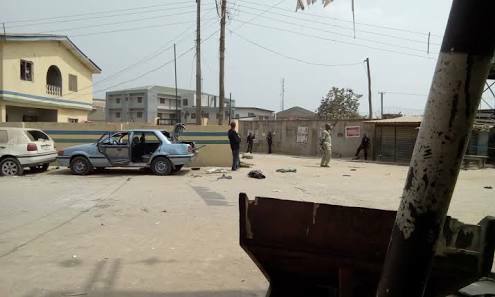 It will be recalled that four armed teenagers suspected to be members of a cult group in March attacked Community Secondary School in the state. The invasion of the school took place after the state government through the ministry of education expelled seven pupils over their alleged membership of a cult group.